"The art of a Vermeer...seeks not to amaze and appal but to invite the observer to come closer, to close with the painting, peer into it, become intimate with it. Such art reinforces human dignity"
Today, the name Vermeer instantly conjures an image of his Girl with the Pearl Earring painting, known as the "Mona Lisa of the North." The 17th century Dutch Master's rendition of an ordinary girl, sublimely glancing at the viewer from a mysterious black background with a shining pearl upon her lobe, has become a universal icon in the canon of Dutch Golden Age artwork. Vermeer's career was devoted to exploring tender moments of everyday life, documenting the private interior spaces of both mind and environment that epitomized the age of Baroque genre works. Yet his mastery of pigment and light elevated the artist beyond the realm of his contemporaries, providing an inimitable glimpse into the lifestyle of his thriving historical era. Vermeer specialized in scenes of domestic life, a genre he helped catapult within the Baroque lexicon. Many of his paintings contain the same furnishings or motifs that inhabited his own private studio, and his models were often women that he knew or relatives of patrons. Vermeer was posthumously titled the "Master of Light" due to the delicate attention he paid to express the way light played upon skin, fabrics, and precious stones in his work. His expertise stemmed from using Renaissance techniques such as chiaroscuro, mixed with his own signature utilization of light, shadow, and paint to evoke texture, depth, and emotion. Colors and pigments were of extreme interest to Vermeer and he was known for his exquisite mixing of ethereal hues. It is said that his long-term patron Pieter van Rujiven bought and provided the artist with expensive ingredients such as lapis lazuli and carmine for these efforts. It is perhaps unsurprising that it was around this time that the painter began his own downward slide into debt, as obsessive as he was about his prized materials. Vermeer was a modestly successful painter in his lifetime, yet only 34 paintings are attributed to him today (a few more are under question), signifying the artist's semi-lackadaisical handling of his career, which would eventually leave him and his family in debt and despair. Because financial insecurity, madness, and depression peppered the artist's life, it has been surmised that the calm idyll Vermeer was known to capture in paint reflected a world that he, himself, perhaps wished to inhabit. Johannes Vermeer was born the in the mercantile Dutch town of Delft in October 1632 to a lower-middle-class family. His father Reijnier Jansz was a hardworking cloth weaver turned innkeeper, and then art dealer. His mother Digna Baltus is thought to have been an illiterate housewife due to her ability to sign only an "x" in place of her name on her marriage certificate. In this painting, Christ sits in the house of his close friends, the sisters Martha and Mary. While Martha is busy cleaning, cooking for, and serving the son of God, Mary sits calmly and contentedly at his feet and listens to him preach. Martha rebukes Christ for not encouraging the other sister to get up and help with the chores but Christ explains that while Martha is "worried and upset by many things," Mary needs "only one," that being the word of God. Martha was seen to be a personification of the active Catholic path where good deeds and humility led to salvation, but Mary is thought to be a symbol for the quiet, contemplative life of Protestantism, which required only the word of God for redemption. In his own way, Vermeer was conveying the theological struggle between Protestants and Catholics that raged not only within his own country, but also within himself. As a recent convert to Catholicism, after his marriage to Catherina Bolnes in 1653, it is unsurprising that one of his first works would depict this Biblical scene. Interestingly, some art historians have suggested that owing to the canvas size, which is the largest of all Vermeer's surviving works, it seems likely that this was a commission for a hidden Catholic church. People who followed the Pope's religion were persecuted in much of Northern Europe and forced to hide their spiritual convictions and services in secret basements or disguised lofts. One of the rare Biblical depictions by Vermeer, the painting radically depicted an intimate scene with Christ as if it were an ordinary, everyday scene. The artist Diego Velazquez would go on to recreate his own version of this iconic scene. This image of The Procuress appears to take place within the walls of a shady, dark brothel. The viewer's eye is drawn immediately to the young woman on the right, as her pale yellow bodice, white lace head covering, and pale skin are the brightest parts of the painting. The woman is looking down at her open right palm, which will shortly receive the coin that the man in red is giving her. That man is possessively curling his body around her, placing his hand over her breast, clearly claiming her for himself. His face is largely hidden in a shadow cast by the broad brim of his feathered hat. In seventeenth century Dutch popular culture, the presence of a feather on headwear held connotations of lechery and sexual immorality, which Vermeer has used to further emphasize the sordid tone. This undertone is also emphasized by the way the man in the center, thought to be a self-portrait of Vermeer, is gripping the neck of a stringed instrument, possibly a cittern, which gives an undeniably phallic impression. The man on the left is dressed in a black beret and a black, possibly silk, doublet with ripped sleeves. These items were in vogue in the previous century, and their placement within this image would have been quite jarring to the first audience of the painting. It could be argued that this man, who attempts to make eye contact with the audience, is attempting to draw them into the scene and make them complicit in the transaction. The inanimate objects within the painting also convey details about the setting. The Turkish carpet in the foreground, which appears to be hanging over a banister, has been an important part of European portrait paintings for centuries, for example in The Ambassadors, (c. 1533) by Hans Holbein the Younger. Vermeer's use of chiaroscuro, a popular technique of the Baroque period, in which light and shade contrast starkly with each other to improve the composition of the piece, appears to be directly influenced by the Italian artist Caravaggio. Similarly, Vermeer seems to have taken inspiration for this scene from other works like The Procuress by Dirk van Baburen, (c. 1622) which was, in fact, owned by Vermeer's mother-in-law Maria Thins and displayed in their shared house. This snapshot of 17th century Dutch life has divided opinion for many decades. Art historians are unable to ascertain whether the young woman is a prostitute greeting a customer or a love-struck girl. The map of The Hague, Netherlands behind her head implies that she is worldly, but her covered décolletage and headdress suggest that she is the daughter of a well-to-do Dutch mercantile family who has just met a dashing young officer. It has been suggested that Vermeer's wife, Catherina, posed for this and many of his other paintings. Certainly the delicacy and care with which he has painted her face would reinforce this notion. 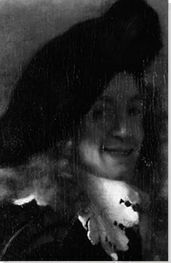 It has also been conjectured that this is one of the first paintings Vermeer produced with the help of a camera obscura. While no written records exist to prove that he used one and one was not recorded in the household inventory at the time of his death, the artist Joseph Pennell noticed the "photographic perspective" of the painting in 1891. He suggested that despite the two figures sitting closely together, the officer is twice the size of the girl. In the photographic age this is unremarkable, but for 17th century painters it would have been more striking and we can see that although other painters placed figures and objects in the foreground and close to the viewer, they were usually in proportion to the space they inhabited. Vermeer has depicted a serene glimpse into city life during the Dutch Golden Age, a period when the economic, technologic, and art world in the Netherlands were at their peak. It is a morning scene with dark clouds overhead and the ships with their sails folded away, docked in their slips, as if a thunder and rain shower has just passed. The large black ships on the right and centre of the image allude to the wealth of the Dutch Republic - a nation that made its fortune through inter-continental, ocean going mercantile and colonial trade. In the foreground, two groups of blocky, sombrely dressed people are conversing. The attire of the two women standing alone is a stark juxtaposition. One is dressed in the typical muted black garments of the proudly Protestant Dutch nation. The other woman is dressed in a cadmium yellow bodice and blue apron, strikingly reminiscent of the woman in Vermeer's earlier paintings like the The Milkmaid, (c.1658). The grey, tranquil river divides the barren foreground and the spiky urban landscape. Painted at a time when cityscapes were not particularly common, the gorgeous serenity of the piece suggests a "heaven on earth," as noted by art historian Andrew Graham-Dixon. One of The View of Delft's most startling qualities is its photorealism when seen at a distance. 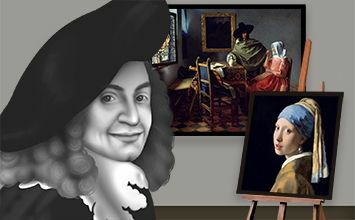 Thus, it is unsurprising that Vermeer is said to have often employed a camera obscura to help enhance the naturalism of the painting. Upon closer inspection, however, it is possible to make out the dots, flecks, and smudges that make up the tonal difference and details of the image. The details of the hull of the boats are pecked out in white and yellow, which hints at the wet surface of the cargo ships. The brickwork on the buildings is similarly brought forward with dabs and splotches, which delicately suggest a recent rain. This early use of what is ultimately Pointillism is refreshing in its simplicity. Vermeer is even reported to have mixed sand into his paint, in order to create the rough rooftops and brickwork of the buildings. With Vermeer's use of detail and realism, it is easy to see what prompted the novelist Marcel Proust, to call it "the most beautiful painting in the world." In this painting, Vermeer shows us the private moments of a woman reading a recently opened letter. She is dressed in a pale blue, possibly silk, bed jacket, worn exclusively within the home for domestic chores or relaxing in private. Her facial expression appears startled, and her chair is pushed away as if she has stood up out of shock. A string of pearls and another piece of paper, possibly the first part of the letter, lie on the table in front of her. Within contemporary Dutch pop culture, pearls were seen as a symbol of virginity, vanity, and piety, as well as wealth, so we can interpret the pearls as a present from a lover or a husband. Her rounded stomach suggest that she is pregnant, although some historians have posited that her rounded stomach is created by the clothing and was fashionable during this period. However, this is at odds with the silhouettes of women in other Vermeer portraits such as Girl Reading a Letter at an Open Window, (c. 1657-59). The map behind the woman might also suggest that she is a pregnant wife awaiting the return of her traveling husband. It is impossible to tell from the woman's expression whether the husband has sent good news or bad. The two blue leather Spanish chairs have appeared in other works by Vermeer, suggesting that these were chairs that existed in his house. Maps are also frequently depicted in Vermeer's oeuvre, providing visual symbolism for the trading and mercantile businesses on which many well-to-do Dutch citizens built their wealth. The hues of the image create a melancholic atmosphere and ultimately, the viewer is left with a sense of voyeuristic expectation, tinged with apprehension as we wait for the woman to tell us her news. Woman in Blue Reading a Letter represents one of Vermeer's most enigmatic and powerful depictions of a new theme in Dutch genre painting (subjects from everyday life): well-to-do women in domestic settings, often so preoccupied that they are oblivious to the viewer's gaze. Girl with a Pearl Earring is undoubtedly the most famous and identifiable portrait of Northern Europe and is as iconic to the Dutch as da Vinci's Mona Lisa is to the Italians. In it, a young woman's face floats against a dark background, left half in shadow. She gazes out at the audience with bright eyes and lips slightly parted as if she is about to speak. It is unclear whether she is turning towards or away from the viewer. The play of light on the Girl's cheek, eyelids, and lips are instantly recognizable as Vermeer was posthumously titled the "Master of Light" and was known for his delicate attention to the way light played on skin, fabrics, and precious stones. Scholars have admiringly noted the lack of linear distinction between the nose and cheek, as Vermeer has counted on his use of light tones to implying the different facets of her face. Similarly, pale pink and white highlights along the lips make them appear moist and fleshy, adding to the air of mysticism that surrounds the image. The audience is left to wonder whether she stopped speaking when she made eye contact with the viewer or had simply paused to take a breath. Rather than a true-to-life portrait of someone, Vermeer's contemporaries would have recognized this genre painting as a tronie - a stock character in costume, with idealized, exaggerated facial expressions, representing characteristics of exotic or foreign lands, that were coming to light in Dutch society, through the thriving business of trade. The girl's fantastical turban is indicative of this, as it was certainly not part of everyday Dutch, or even European garb. The pearlescent globe, hanging from her left ear, is also suggestive of far off lands as pearls were imported from the Persian Gulf. As with many of Vermeer's works, mystery revolves around why he painted what he did. Certainly he had more freedom than many of his contemporaries, like Rembrandt, who took commissions, and trained pupils to earn a living. Thus it seems that Vermeer painted the Girl to amuse himself and to challenge himself artistically. Some scholars have argued as to the identity of the sitter, with some suggesting that it was either his oldest daughter, Maria, or the daughter of his patron, Magdalena van Ruijven, both of whom would have been twelve or thirteen years old at the time of painting. If this is the case, it suggests a desire to document his child's or his friend's child's beauty for posterity and admiration. Painted in around 1665, it wasn't until the turn of the twentieth century, after long-overdue restoration work, and with the publication of Tracy Chevalier's 1999 novel Girl with a Pearl Earring that the Girl was catapulted to international stardom. The painting continues to influence contemporary artists. The British graffiti artist Banksy repainted the portrait on an exterior wall in Bristol, UK, in his characteristic street-art style with tonally applied deep blue paint. The iconic pearl, which historians are unsure as to whether it is an unusually large pearl or simply polished tin, has been replaced with an unassuming burglar alarm. Regardless of the identity of the mysterious girl, or the authenticity of her pearl, her face remains an iconic image of youthful beauty in Baroque art. Vermeer ended his artistic career the way he started it, by painting an intrinsically, even inescapably Catholic image. Many scholars believe that this image was commissioned for yet another private hidden church, or schuilkerk, by Dutch Catholics. In it we see a drawn tapestry that reveals the scene, in all a reflection of the curtains that hid many churches in Netherlandish homes. On a raised, altar-like platform, a woman in the white and blue of purity is thought to be the penitent Mary Magdalene. She is shown looking up from the Bible to gaze at the crucifix, transfixed by divine love. Her foot rests on a terrestrial globe, while above her head hangs a celestial globe; an indication that she is suspended between the earthly world and the heavens. On the floor in front of her, a snake symbolizing Satan lies crushed and bleeding under the weight of a stone slab. The slab denotes the rock of the Catholic Church. The large painting in the background is a simplified version of Christ on the Cross by Jacob Jordaens (c.1620), which was also owned by Vermeer's mother-in-law. The older painting even appears in the inventory of Vermeer's belongings after his death in 1675. The chair holds a plump ultramarine cushion which could be a thinly disguised prie-dieu - a low stool on which Catholics would kneel to pray and contemplate, which further reinforced the idea that the viewer is witnessing the transformation of wine into blood, the Transubstantiation, unfolding within this hidden sacred space. Ultimately, the viewer is left with the sure knowledge that Vermeer was devoted to his adopted faith.